Ever wonder where that expression came from? It is attributed to John Gower in his exciting and concise little 33000 line poem called Confessio Amantis and dates back to 1383. The phrase relates to unsavoury merchants that substitute chalk for cheese in order to increase their profits. Nowadays we use it to highlight extreme differences. A perfect way to do this is to make your own gnocchi at home. The supermarket varieties tend to be very rubbery, often contain less than 50% potato and are very heavy. Here is a simple recipe that makes a delicious, tasty, light dumpling and is surprisingly easy. Peel the baked potatoes and mash them. Add the eggs, salt and pepper and mix well. Add 1 cup flour and mix well. The potatoes will absorb the flour and if the mixture is too sticky and soft keep adding more flour until it forms a “dough” that is a little tacky but holds together. The amount of flour you need to add will depend on the type of potato, the size of potato and the moisture content. Flour your surface well and break off a tennis ball size piece of dough. Roll it out into a long sausage about 2cm thick. Cut the sausage into pieces about 3cm long and place them on a plate to rest while you finish rolling the rest of the dough. Cook the pieces in boiling salted water. When they float to the surface they are ready. Remove from the water and drain well, then add the gnocchi to your favourite sauce. 3 Responses to Chalk and cheese…. And to whom is that quote at the end of the post directed to???? Yum! 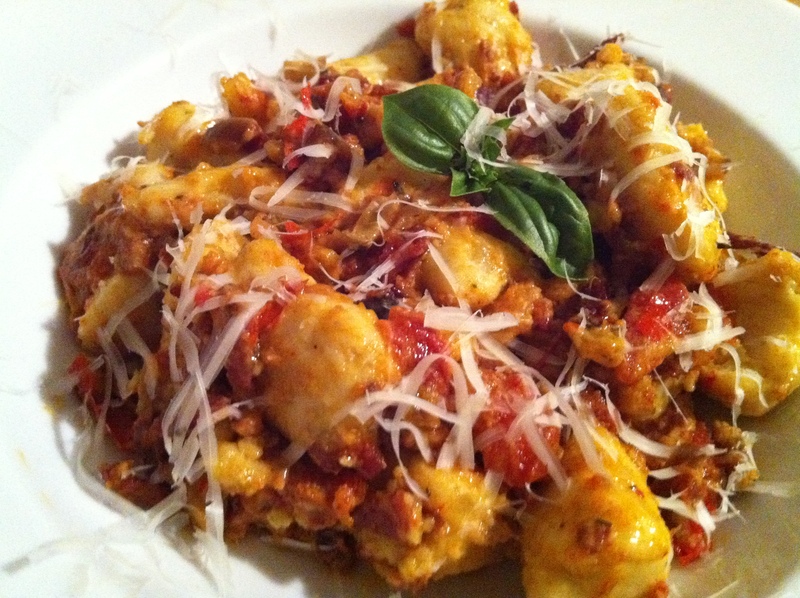 Great gnocchi recipe – can we place an order?